Julian Assange, "From Hero To Villain" VS "From Villain To Hero"
Stockholm: Leading paper Dagens Nyheter did run on 22th of June an editorial on Assange titled “Not A Hero Or Victim“. A main argument put forward by DN – as also repeated in BBC by Christian Christensen (an American researcher and now professor of media at Uppsala) is the U.S. propaganda trick of presenting a purported Assange’s “contradicting” attitude by seeking asylum in a country criticized – as DN put it – “for silencing” the oppositional press. “When you look at it from the media perspective what’s interesting here in the discussion of the choice of Ecuador…just doing a little bid of research and looking some background there . . .Ecuador has not particularly good record when its comes to freedom of speech and journalism rights… So that Assange is looking at Ecuador as a possible location is interesting in the respect that . . .for (being) the founder of WikiLeaks . . . It is interesting that it is a country that is not exactly famous for its freedom of expression rights and press rights. So there is a sort of contradiction there, and that raise a number of questions about, you know, (Assange’s) motivations behind picking Ecuador. 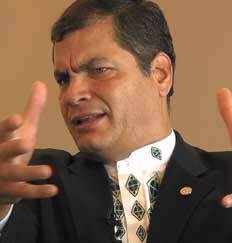 In the background, the dispute between the Ecuadorian government, representing the people of Ecuador, and certain sectors of the media, is NOT an ideological dispute on freedom of expression. It is a classical class-confrontation among the corporate MSM world and their high capitalistic ownership concentration of the media, and the authentic interests of the Ecuadorian people to be informed beyond the monopole interests of the Ecuadorian oligarchy – or of their American mentors, such as this apprentice of Troll represents. In concrete, the “confrontation” it has been about injurious or libel articles in some oppositional press which the government had denounced to the courts of justice in democratic Ecuador, leaving the independent justice system to assess the criminal character of such political motivated smear. 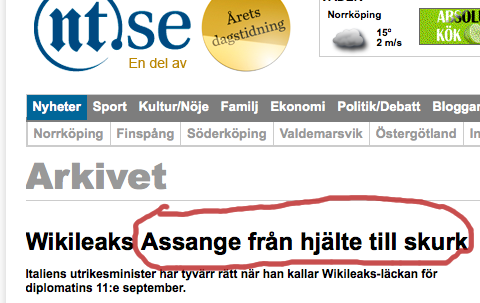 In the line of DN ad-hominem characterizations of Assange, several MSM papers in Sweden, including State-owned media apparatus, have headed their editorials or articles, “Assange From Hero To Villain” (“Från hjälte till skurk”). June 30, 2012 in Uncategorized.